The train that derailed in Switzerland was carrying around 200 people between Tiefencastel and Solis, according to a statement from the cantonal police department. The statement said that a rescue and evacuation operation is in process involving the air-rescue and ambulance services, firefighters, Alpine Rescue and police. 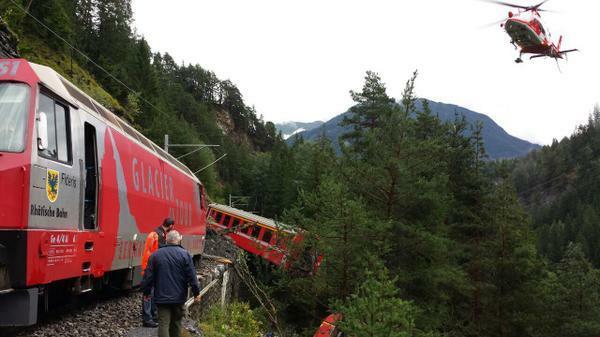 Swiss train operator Rhätische Bahn has confirmed that one if its trains had derailed. The company tweeted that some carriages have left the track. The derailment has happened near Tiefencastel in the east of the country. At the moment there is no information about casualties. Rescue organisations local police and representatives from the rail company are at the scene. Bei Tiefencastel sid wegen einer Rüfe einige RhB-Wagen entgleist, keine Infos zu Verletzten. Rettungsorganisationen vor Ort. Infos folgen.